Let us advise you on the best way to winterize your pool after the warm season. When the warm season comes to an end, you should think about winterizing your pool. 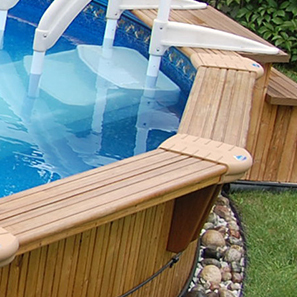 When performing this step, it is important to follow instructions carefully since the maintenance of Aqua-Wood pools differs from that of traditional above ground and in ground pools. To begin with, it is recommended that you winterize your pool as late as possible, after the fall season’s abundant rains are over and the soil has begun to freeze at night. Proceeding in this fashion will help you keep pool water clear and limpid and will also protect the liner from sun damage. The filtration system must be stopped only when the pool is winterized, in order to prevent pipe freezing. As needed, make sure to circulate water in your heat pump.